A few days ago, I took my tripod out on the land. It was a disaster. The legs caught on everything. It took forever to set up, and then I'd wait and wait, but the critters would hide until I packed up and moved on. So yesterday I tried the monopod. It worked wonderfully. I left it extended with the camera attached. It was easy to drag along, and I could brace the bottom on the ground at an angle and then rest it on my knee or hip to steady the camera. When I got it right, the results were really great. Click the picture below to go to my critter photoset. New pictures include spider babies, dragonflies and turtle eggs. I think that's a jumping spider. They are the cutest! This is a fantastic photo. Ok. You saw Spiderman III. No reason to brag about it. Just tell us all how it was. Nice shot. 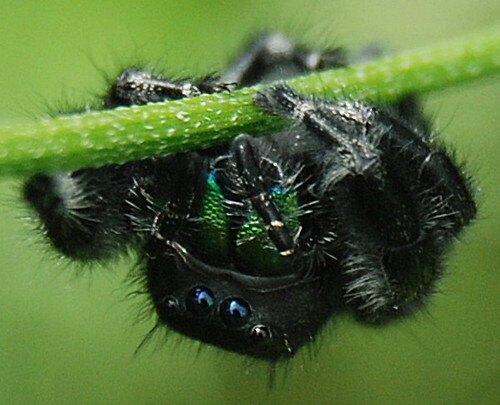 Looks like what is it Phidippus.